Park and Ride. A simple concept that takes the hassle out of motoring in City Centres. Roll up in your car, often just off a motorway or a trunk road, park up, buy a ticket, hop on a frequent, posh bus and Bob’s your uncle. Simples. Oxford has 5 park and ride sites and it works well. Others are dotted around the country. But one park and ride has bitten the dust, and we’re going to be all the poorer for its loss. “Woosh” in Worcester has “wooshed” its last. I was there back in 2001 when it opened. 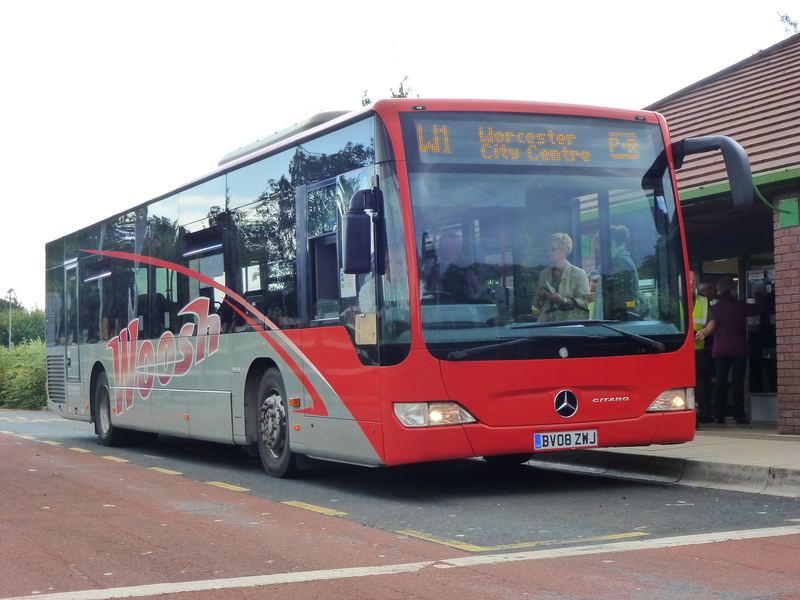 Originally with buses operated by Midland Red West (now First), it later went “in house”, with Worcestershire County Council taking the reigns with attractive Mercedes vehicles sporting a “Woosh” fleetname. It did what it said on the tin. “Wooshing” between the Perdiswell site on the outskirts of the City every 10 minutes or so, the attractive facility seemed to be a great idea to tackle the ever-growing traffic congestion in this attractive, historic City. Now, it’s gone. A victim of more cuts in a Council that has to save £25m per year annually over a four-year period. There’s no room for sentiment, nor, seemingly, for a longer-term view of the impact of this closure. The money people point to the decline in usage of the site. It loses £186,000 per year, apparently. The closure is part of a wider £1.6m saving being made to council-supported services across Worcestershire, although the cuts haven’t been as savage as first mooted. Nevertheless, it’s a blow to those of us who see beyond the endless stream of cars choking town and City centres. A fair point. But how do you raise awareness? And who pays for the advertising? And, like many Cities,there is a reluctance to physically limit where cars can go. Businesses cling to this idea that if you restrict the car, you potentially damage business. A recent Greener Journeys report tackles this myth, but with a lot of nervousness following the recent economic woes, there isn’t the will to experiment with such plans. In 2008,Perdiswell Park & Ride was used more than 450,000 times. Last year, it hit a record low of 274,935. Just 200 cars use it on some days. On figures alone, it is easy to see why the bean-counters have struck. And Councillor Joy Squires, Worcester’s Labour parliamentary candidate, said: “Surveys have repeatedly shown that traffic and congestion are the top concerns of Worcester residents and this will deter both employers and tourists”. Normal bus services stop outside the Park & Ride site, but these are less frequent and it isn’t clear where you’re supposed to park your car if the site is closing. Another Worcester Park & Ride site – from Sixways to Worcestershire Royal Hospital – appears to have escaped the axe for now. These are no doubt difficult decisions for the Council to make. There is a much wider political argument to be had about Government spending, and how much they give to Councils for local services. Faced with ongoing annual cuts of £25m, it isn’t difficult to understand that something like Park & Ride is a relatively painless cut to make. In the short-term, it just means that the motorists carry on into the City to do battle for the ever-more elusive car park space. “Only 200 cars” using it on a bad day may seem a good enough reason to close it, but that is 200 more cars to choke the City. In the longer-term, it damages further. It says that there really isn’t an alternative for motorists to “do their bit” and stop choking the City. The car parking charge may be marginally more expensive, but it isn’t a game changer. And yet the best park & rides are great adverts for buses to those who aren’t regular users. The smartest buses are usually on park and ride, and if it makes people consider that buses aren’t quite as bad as they’d imagined, it may even encourage them to consider a greater use of buses. Coupled with bus priority, simple, competitive fares, attractions like free wifi and posh seats, etc, it begins a virtuous circle that says, hey, you’d be a fool to carry on driving into all of this – it’s much simpler and quicker on the bus. “Woosh” may not have had free wifi, etc, but the buses were immaculate, comfortable and attractive. And when I was there taking photos in the final week of operation, an elderly couple started talking to me, expressing their regret that a “great idea” was being stopped. And I agree entirely. The closure of the Worcester Park & Ride may be a short-term economical fix for a cash-strapped Council, but the wider view is much bleaker. The Lure of the Bus Station…. I’m rather spoilt. 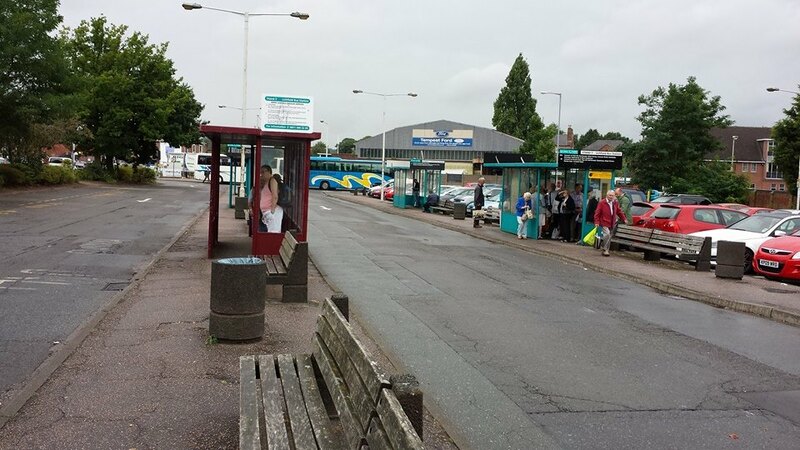 My local bus station – the one I call “home” – is in Stourbridge. A couple of years ago, Centro spent millions on it and declared it “World class”. And I think it is. Smart, futuristic, protected from the elements, and a rather nice welcome to the town. Even the subway – once a target for my whinging in the local paper – is almost bearable these days (although why we can’t have a pedestrian crossing to slow down the hot heads on the Ring Road is a secret only people in the council’s traffic department know the answer to). As you know, I’m rather fond of sampling bus services all over the place. I recently found myself in the confines of Lichfield – “Staffordshire’s Premier Heritage City, nestled in the heart of the Country’s most creative county”, goes the promotional blurb. And, actually, it looks rather nice. But only if you don’t approach it from the bus station. I arrived on the train at Lichfield City, just over the road. A fairly innocuous spot on the rail network, I was greeted by the scourge of the now ubiquitous white 4×4 with wide-eyed driver oblivious to anything that moves, scanning the landscape for an empty spot the size of a small house in which to park. At least there is a pedestrian crossing with which to momentarily halt the never-ending line of traffic outside the front of the station. The bus station lies opposite, so “integrated transport” of sorts. Two long lanes, containing various bus shelters the like of which Arthur managed to demolish in the “On The Buses” film stand as a tribute to the lost world of the 70s & 80s. In fact, you’re so lost in a time warp, you half-expect to see a Midland Red half-cab D9 double decker with clippie hanging off the back roll up. I scan the landscape for information. “Where to board your bus” is attached to a lamp post, but it’s only for Arriva services. If you happen to want a bus operated by someone else, you might want to consult that crystal ball you’ve been lugging about. Each stand appears to have at least some information hammered up on the roof, but is it trustworthy? Most of the stands have been treated to a lick of paint – Arriva “aquamarine” – but it’s only slightly more attractive than the bare metal underneath. Let’s just say Arriva’s corporate colours suit their buses far better than permanent fixtures. The row of windswept stands is punctuated by wooden benches, but I guess there aren’t many days in the UK’s calender where the good people of the Cathedral City sit out and admire the view. There appears a complete lack of interest (or probably money) on the local authority’s part to bring some semblance to the proceedings. So the operators have done their best to inject a bit of life into the place. Several departure stands now bear colourful images enticing you to their services – indeed Geoff Cross of Central Buses sent me before and after pictures of what they’d done to promote their X55 Express to Tamworth after I bemoaned the place on Facebook. In fact, Geoff’s buses do brighten up the place, and there’s a bit of a “bus war” going on between Central Buses and the mighty aquamarine on the corridor, the latter sending posh Mercedes buses into battle. Talking of bright colours, Midland Classic’s X12 to Burton-on-Trent also brings a splash of life. Their smart red and yellow livery can be spotted from the other end of the bus station, but the gaggle of concessionary pass holders awaiting a run to the land of “me duck” are, on this occasion, disappointed – the X12 they’ve all shuffled forward to board instead takes the other bus station lane – this one is the hourly extension to Sutton Coldfield in the opposite direction instead. It isn’t long before Midland Classic’s X12 to Burton arrives and there is much tapping, bleeping, swiping and “thank you, me duck” going on. Then I am left alone in Lichfield bus station. Everyone I’ve seen in my brief time here seemed over a certain age. Demographic use of buses is another argument for another day on another blog post, but it does make you stop and think. How are other age groups getting around Lichfield? What could be done to stimulate passenger growth here? Geoff’s innovative X55, which goes “fast” and direct to Tamworth is a good attempt: previous to this, there wasn’t a direct link, instead the bus route went around the houses. Now Arriva are competing head on. Maybe growth is being stimulated after all. But it isn’t through the appearance of the bus station itself. It all feels rather depressing, bland and uninviting. Maybe the Council or Authority will tell me the funds aren’t there – and that’s a real probability. But that also tells you partly where buses are on the league table of priorities of local Councillors, who will no doubt be happy to field complaints about the standard of their local bus services come election time, without bearing any of the responsibility for local traffic congestion, or indeed the standard of the facilities in the bus station. Of course, it’s easy for an armchair critic like me to point these things out, and I accept the whole scene is more complex than I am perhaps making it, but other towns have found ways of building new facilities, even if it has taken years. Buses are important, and none more than bus stations. Smart, functional, attractive facilities send a message that buses need not be seen as a mode of last resort, and they can be part of a much wider package that boasts clean attractive buses, competitive fares and bus priority measures. Sadly, any excitement I might have for bus services in Lichfield is currently on hold, entirely due to its “gateway” – Lichfield bus station.